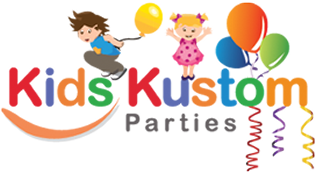 Grab your magic amulets and head to Kids Kustom Parties in Palatine, IL. 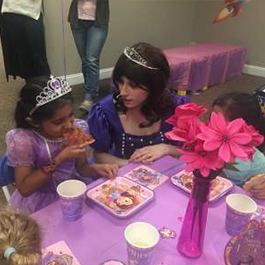 We’ll transport your child and her guests to Enchancia for a very special Princess Sofia birthday party. 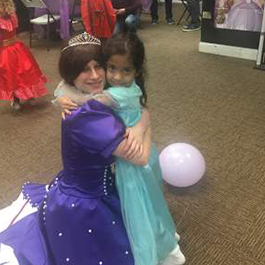 We offer three Princess Sofia birthday party packages to fit your child’s imagination and your budget. Princess Sofia will host and entertain your little ones with our silver or gold packages. Not only does she wear a costume, but she is also a theater-trained character actor who sings and dances. Your little princess and her friends will be enchanted. Plus, your child will get to wear a Sofia princess costume. ALL the birthday party guests will get to wear princess costumes, too! Capes and masks for the boys! What’s more, our gold package features another party character of your choice. 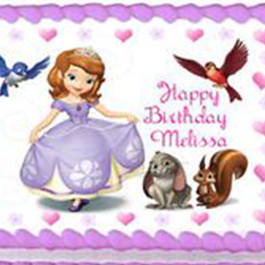 If you prefer to have a home party, Princess Sofia and other kids party characters can come to your venue. Sofia the First is a Disney Junior animated series. Sofia is a mixed-heritage princess in a fairytale world. Both her parents are from enchanted kingdoms. Her mother, Miranda, is from Galdiz, a kingdom inspired by Spain. Her father’s kingdom is inspired by Scandinavia.